Everyone wants to be independent. That’s true no matter your age. But it can be especially important when you face the physical challenges that sometimes accompany aging. In fact, one of the most common desires among older adults is to remain as independent as possible, as long as possible. While many people achieve this goal by staying healthy, sometimes accidents or unforeseen illnesses can threaten independent vitality. When a physical injury limits your mobility, or an illness disrupts daily life, taking advantage of rehabilitation services can help you to get back on your feet and remain independent much longer. Rehabilitation services at Diakon Senior Living Services cover a variety of therapies and meet the needs of adults in less-than-their-best health. In fact, many seniors turn to rehab following a hospital stay if they’re not yet able to return home. Others seek outpatient rehab to continue therapy after an injury or surgery. Whether physical, occupational or speech therapy, such programs can help you to regain optimal abilities and well-being. If you face an illness or injury with the risk of loss of independence, rehabilitation can help you maintain independence longer and to the extent possible. 1. Allows you to maintain your daily routine. 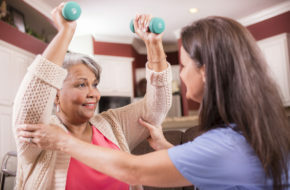 Recovery can be a long road for older adults, but rehabilitation can help you get back on your feet—and back to your regular lifestyle—much faster. Those who opt out of rehab or therapy might not heal as quickly or suffer from subsequent injuries, making it harder to maintain a daily routine. For example, if a shoulder injury doesn’t heal correctly, you may always need help lifting heavy loads or reaching above your head. Rehabilitation services can help you to meet your goals for continuing your normal way of life. Click here to read more about what rehab can do!